In the creation of the above video, I played a descending power chord chromatic scale using the windmill guitar strum on each chord. Meanwhile, an assistant took video clips at random points in time, capturing me in various phases of the windmill strum. I then reorganized the video based on the position of my arm. The windmill strum gesture is thus preserved, including the sound of the strum, and the decay of the resonance. My left hand, however, no longer plays a chromatic scale, but instead, jumps to arbitrary fret positions based on where the hand was when the assistant captured the moment. In my 'Sound-Grains X Stop-Motion' project, I create stop-motion gestures and sonic 'grain clouds' by (re)organizing chopped up video footage based on arbitrarily phased visual cues within a loop system. More examples here: http://www.dantramte.com/sound-grains-x-stop-motion.html (to turn on the audio, click the speaker icon in the top left corner of each video). —2) an endless visual sequence such as a pendulum, moving performer, or rotating fan. Using the application called 'Vine,' one must take quick, randomly timed snapshots of this performance. Since the video footage is taken at arbitrary points within the phase of the visual sequence, the 'video grains' will be out of order. One must then reorder the thumbnails of the video using Vine's editing software. This process is quite easy, and anyone with a smart phone should be able to make these videos within minutes. I thus propose a performance practice in which multiple musicians simultaneously execute sonic and visual loops on stage, while audience members generate 'sound-grain X stop-motion' videos during the performance. 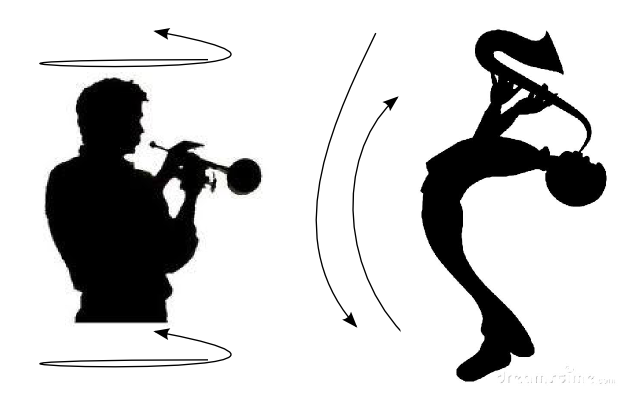 For example, a trumpet player and a saxophone player each play repeating ascending scales; the trumpet player slowly spins in clockwise circles and the saxophone player slowly bends backwards and forwards, creating an up-down sequence as is illustrated below. Audience members may freely walk around the musicians and take short 'video grain' footage of their performance. Once they have captured 6 seconds worth of video grains—Vine's time-allotment—they may begin to assemble the videos in order of visual cues. 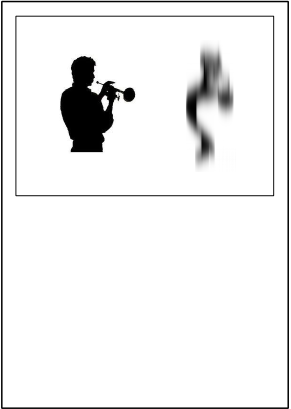 If, for example, one audience member chooses to assemble the video grains in order of the saxophone's standing position, then they will create a video in which the saxophone exhibits a visual continuity while the trumpet player's rotational position will be random, out of sync, and sporadic. If a different audience member captures footage and reorders the video grains based on the rotational visual cues from the trumpet player, then the opposite result would occur. While each of the above scenarios will result in 'virtuosic grain clouds' within the pitch parameter, the sound will not be completely discontinuous. Indeed, as the trumpet player rotates, the timbre slowly evolves due to the change in acoustics when the bell is pointed in different directions. If a video was created by reordering video grains based on the position of the trumpet player's rotational phase, then the timbral evolution of the rotating trumpet would be preserved! The performance of this work should be understood as an interactive audience participation installation. Ideally, musicians will perform their respective audiovisual sequences throughout the day as an ongoing performance. Audience members will arrive at the venue at any point in the day, create their videos, and leave the venue at their leisure. This work was inspired by Johannes Kreidler's Hitler's Rage Remix, in which he chopped up a scene from the 2004 film, Downfall into hundreds of short clips less than half of a second in length, and re-arranged the video grains in order of audio amplitude from quietest to loudest. The result is a video which exhibits continuity in one parameter (audio amplitude), but generates an interesting form of randomness in other parameters (video, timbre, etc. ).